Excavators or tractors might be your first thought when you hear JCB, but they are eager to accessorize their machines with some tough phones. 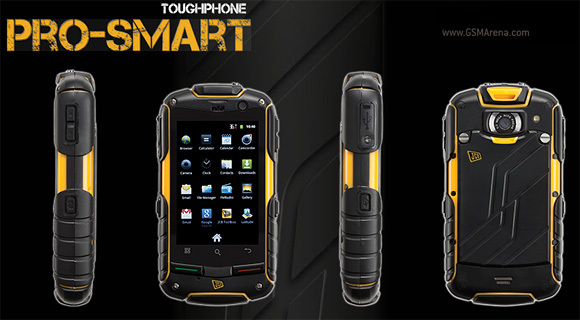 Their latest is the Toughphone Pro-smart, which just went on sale in the UK, along with the Toughphone Sitemaster2. The Toughphone Pro-smart is a Gingerbread droid with an IP67 certification - completely dust tight - and it can last 30 minutes under a meter of water. The 3.2" HVGA screen is scratch resistant too. The specs of the phone aren’t very impressive - 800MHz CPU, 3G (tri-band), Wi-Fi, 5MP camera and a microSD card slot. The phone measures 125 x 62.2 x 20.5 mm. But more important are the 2000mAh battery (good for up to 15 days of standby and up to 9 hours of talk time) and the carry strap with a carabiner and a compass you get - both will be of much more use in the great outdoors than a high-res screen or a quad-core processor. One potential downside of the JCB Toughphone Pro-smart is that there's no GPS listed in the specs - that's not a problem if you can navigate just by compass, but still. Update: Our readers are reporting that the Pro-smart does have a GPS even though it's not listed in the specs on JCB's or Clove's sites. Anyway, the Pro-smart is competing against the JCB-branded Motorola Defy+ (and the vanilla version too, we suppose), which has similar sounding specs, including the IP67 certification (though the screen is much better). You can grab a JCB Toughphone Pro-smart from Clove UK for £310 if you're interested. You can also grab it from JCB's site, but that costs £335. Just keep in mind that a vanilla Motorola Defy+ goes for £190. 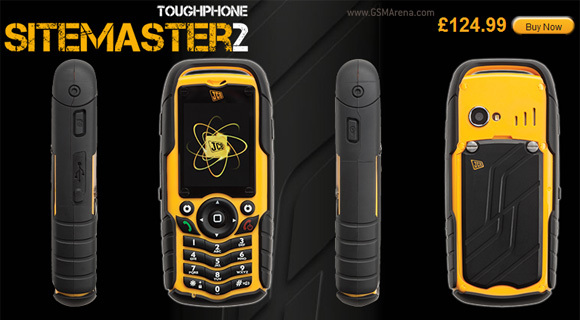 The Toughphone Sitemaster2 is a feature phone, but it's even tougher - it's been drop-tested from 2 meters and can tag 1 ton of pressure. It gets the same carry strap as the Pro-smart, but also a 3-in-1 mains and wind-up charger. The specs of the phone are: 125 x 57 x 22 mm, quad-band 2G, 2" QVGA screen, up to 8GB microSD card support, Bluetooth 2.0 and a 1250mAh battery good for almost 15 days of standby or 5 hours of talk time. The JCB Toughphone Sitemaster2 can be had for £119 from online retailers or for £125 from JCB's site. i´m interested in this telephone. Do you know if i can buy it in Argentina?or another way i could have it. yes but Rock does not have CE so cannot be sold in Europe. You are right though out of the same factory. The EU version is sold by Durrocomm in the UK and called the Utano barrier. Same phone but cheaper and with dual sim.